Ready made and self levelling products, set using UV light. Giving nails flexibility, it’s recognised and favoured for its natural high shine and glossy appearance. Acrylic liquid mixed with different coloured powders to create a strong, durable finish. Acrylic, gel or fibreglass / silk coats natural nails to enhance their strength, quality and shine. No tips required. This is perfect for nails that get brittle when they reach a certain length. Designed for perfection to give you long lasting and perfect manicured nails for up to 2-4 weeks. Wears like gel. Flawless finish. Smudge and Scratch resistant. No drying time. Yes really! Stocking over 100 colours to choose from. Select from one of my own designs. From subtle wedding designs to everyday wear and crazy party designs. There’s something for every one. 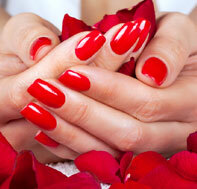 Return to the salon every 2-3 weeks for regular maintenance on your nails. Always use a Non-Acetone Nail Polish remover when removing nail polish. Always use cuticle oil to keep treated nails fed and cuticles unattached. Wear gloves when doing dirty jobs – gardening, painting, fake tans, hair dyes etc. and also when using hardy chemicals like bleach, oven cleaner, bathroom cleaner – anything corrosive. Do not attempt to use nail clippers, scissors or metal nail files should your nails appear too long. This will shatter the enhancement. Always use a nail file recommended by your Nail Technician. Do not pick at your nail enhancements. Do not attempt to remove the nail enhancements yourself. It is advised to return to your Nail Technician for expert attention on removal and restoration of your natural nails. Contact your Nail Technician if you are unable to make your appointment.